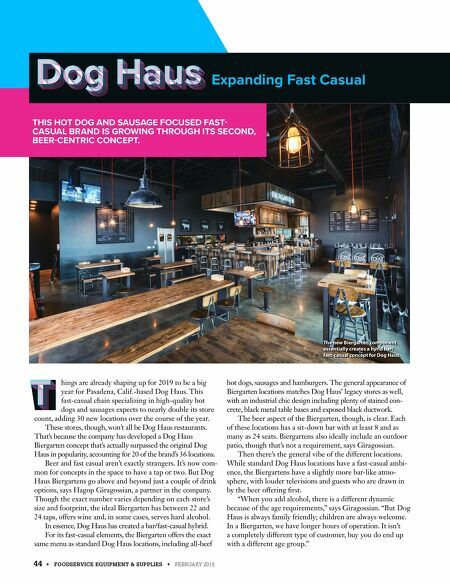 44 • FOODSERVICE EQUIPMENT & SUPPLIES • FEBRUARY 2019 hings are already shaping up for 2019 to be a big year for Pasadena, Calif.-based Dog Haus. This fast-casual chain specializing in high-quality hot dogs and sausages expects to nearly double its store count, adding 30 new locations over the course of the year. These stores, though, won't all be Dog Haus restaurants. That's because the company has developed a Dog Haus Biergarten concept that's actually surpassed the original Dog Haus in popularity, accounting for 20 of the brand's 36 locations. Beer and fast casual aren't exactly strangers. It's now com- mon for concepts in the space to have a tap or two. But Dog Haus Biergartens go above and beyond just a couple of drink options, says Hagop Giragossian, a partner in the company. Though the exact number varies depending on each store's size and footprint, the ideal Biergarten has between 22 and 24 taps, offers wine and, in some cases, serves hard alcohol. In essence, Dog Haus has created a bar/fast-casual hybrid. For its fast-casual elements, the Biergarten offers the exact same menu as standard Dog Haus locations, including all-beef hot dogs, sausages and hamburgers. The general appearance of Biergarten locations matches Dog Haus' legacy stores as well, with an industrial chic design including plenty of stained con- crete, black metal table bases and exposed black ductwork. The beer aspect of the Biergarten, though, is clear. Each of these locations has a sit-down bar with at least 8 and as many as 24 seats. Biergartens also ideally include an outdoor patio, though that's not a requirement, says Giragossian. Then there's the general vibe of the different locations. While standard Dog Haus locations have a fast-casual ambi- ence, the Biergartens have a slightly more bar-like atmo- sphere, with louder televisions and guests who are drawn in by the beer offering first. "When you add alcohol, there is a different dynamic because of the age requirements," says Giragossian. "But Dog Haus is always family friendly; children are always welcome. In a Biergarten, we have longer hours of operation. It isn't a completely different type of customer, buy you do end up with a different age group." Expanding Fast Casual THIS HOT DOG AND SAUSAGE FOCUSED FAST- CASUAL BRAND IS GROWING THROUGH ITS SECOND, BEER-CENTRIC CONCEPT. The new Biergarten component essentially creates a hyrid bar/ fast-casual concept for Dog Haus.